I mentioned in my ABS-CBN TV Patrol interview that I am not interested in joining the childish mud slinging between my political opponents Governor Moreno and Mayor Emano and as Government Officials, we must focus instead on Public Service. But many ordinary citizens and media practitioners who are bothered and concerned about the unliquidated cash advances issue are calling me and asking about my statement regarding this issue in the SunStar Newspaper as quoted below. 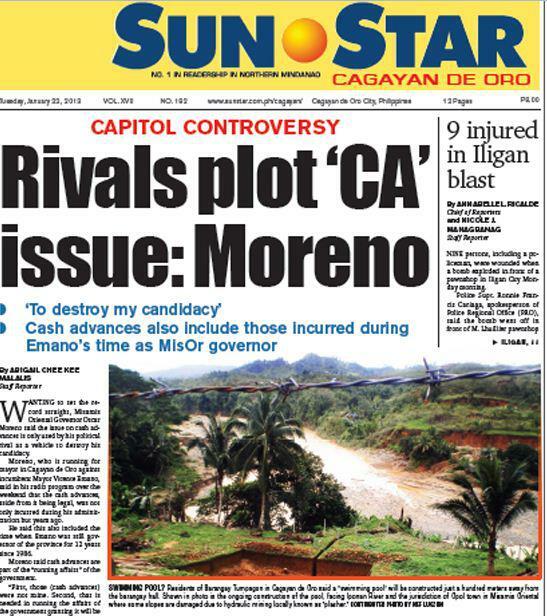 The title of the linked SunStar article 'Guv: Rivals plot ‘cash advance’ issue' must be made more specific. 'Rivals' include me and all others who filed their COCs for Cagayan de Oro Mayor. As far as I'm concerned, the first time I set my eyes on this issue was when I saw it in the news. I focus on more important things like helping save the environment and helping make lives better. So kindly make it clear who the Governor is accusing as the plotter of the issue because false accusations against me will be dealt with accordingly. There is nothing wrong with Cash Advances as long as they are being used for REAL public service and are properly liquidated PROMPTLY. If those P96 million worth of unliquidated cash advances encompass Provincial Government officials from 1973 to 2009, they must ALL (especially those who are still alive) be made to liquidate immediately; otherwise, they must answer to the taxpayers of the province of Misamis Oriental and be banned from holding public office in the future. Galing Pook Award is a prestigious honor but still it awards the best among the participating government units who are mostly, if not all, not perfect. There is a big difference between best and perfect. They say that corruption is rampant in Philippine politics so most probably, many of the participating government units have similar problems but they just go unnoticed. The question is, are those cash advances properly and promtly liquidated? If yes, that's good and make the supporting documents available for public consumption. If not, that's the problem. Another question is, are the people of the Province of Misamis Oriental willing to let bye gones be bye gones and just simply turn a blind eye? Final question is does the people of Misamis Oriental and Cagayan de Oro City willing to elect officials who does not liquidate public funds and actually get away with it? As for me, I simply refuse to lower my standards and go for what they call lesser evil. It is time for real change and you have the power to change how things work. Exercise your right to vote wisely. WANTING to set the record straight, Misamis Oriental Governor Oscar Moreno said the issue on cash advances hurled against him is only used by his political rival as a vehicle to destroy his candidacy. 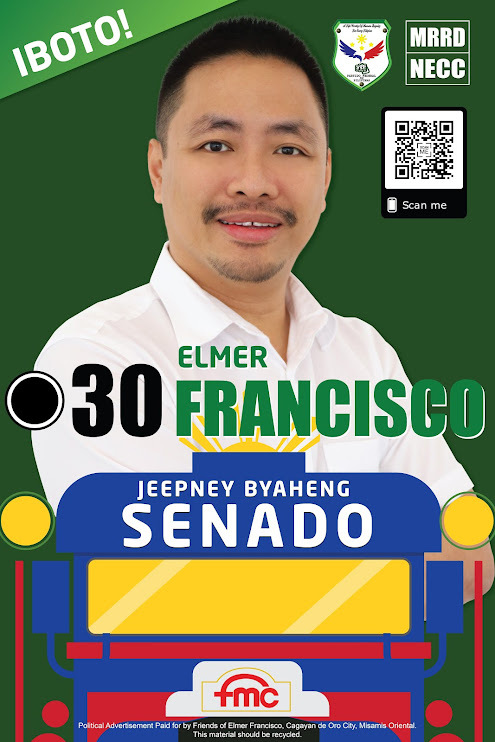 Moreno, who is running for mayor in Cagayan de Oro against incumbent Mayor Vicente Emano, said in his radio program over the weekend that the cash advances, aside from it being legal, was not only incurred during his administration but years ago. He said this also included the time when Emano was still governor of the province for 12 years since 1986. Moreno said cash advances are part of the “running affairs” of the government. “First, those (cash advances) were not mine. Second, that is needed in running the affairs of the government granting it will be liquidated immediately,” he said. Moreno claimed that the province has been a recipient of Galing Pook Award twice. He said nominations for Galing Pook Award are based on the local government’s best practices. “We have brought back the dignity and integrity of Misamis Oriental and the good relationship and partnership between the Provincial Government, the church and non-government organizations (NGO) are proofs of their trust,” Moreno added. He said all these were not even done during the time of Emano. But Emano regarded Moreno’s statement as “weak” as he urged the governor to explain clearly and liquidate the cash advances immediately.